The two Chinese zodiac signs of the dragon and the snake can be very good together in love. They will need to know each other’s patterns and motivation. The dragon is more bold and full of energy. The snake is appealing in a more subtle way. They will likely find each other physically appealing. The dragon and snake love compatibility will be excellent in a romantic relationship. The dragon and snake in bed will have a physical attraction to each other that is sexually bold. They will also have an intellectual connection. When the dragon starts dating a snake, they will likely be attracted to each other immediately. They both are seductive and appealing but in different ways. The two Chinese astrology signs of the dragon and snake both have personalities with a lot of strength. The dragon and snake relationship can be encouraging and satisfying. However, both will have to accept each other’s differences. They will be lively and motivated together. Both will work for and achieve their goals. The differences in a dragon and snake relationship are not necessarily opposite. Both the dragon and the snake will have to have patience and acceptance if they want their relationship to be successful. The snake will depend more on their intuition rather than logic. They might be more selfish and even somewhat lazy, especially if they are feeling fulfilled. They might seem less motivated. They have an inner insecurity which might cause them to be envious and clingy. They are calm and patient. They will look forward to work and achievements. The dragon depends more on luck. They will take advantage of different circumstances and opportunities they see. They have a lot of active energy and enthusiasm and might soon lose patience with the snake. They can be spontaneous and controlling. They are very smart with business. They will be able to give the snake a sense of hard work and common sense. The dragon snake friendship can be good if they encourage each other. They might have arguments if they are trying to explain opinions to each other. The snake man or snake woman enjoy having things one way. The dragon man or dragon woman will want the snake to see things differently. The male dragon will prefer a a female snake who is smarter and more controlling. The male snake will give the female dragon security who is exciting. The breakup of this love match will happen only under dire circumstances. The dragon snake marriage can be a successful relationship if they are motivated. Both the dragon and snake soulmates can benefit from the relationship. They can both be helpful and useful to each other. 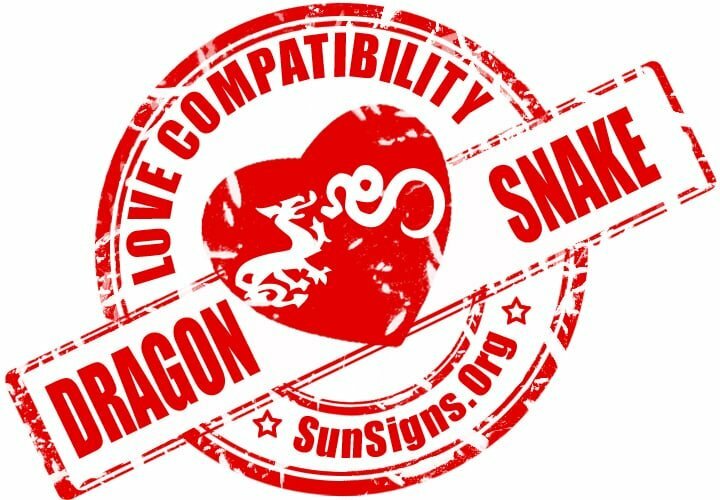 Dragon & Snake Chinese Horoscope Compatibility Rated 5 Hearts!